Meeting at the Masonic Hall, Albert Road, Clevedon BS21 7RN. 18.45 On the fourth Wednesday, February, April (Installation), September and November. The Lodge has 57 subscribing members. 28th November 2018 - The visit of the Assistant Grand Master. Yet another occasion when the lodge was packed this evening with members and visitors. The star of the show was undoubtably R.W.Bro Stephen Davison the Assistant Grand Master who was paying a private visit to the Lodge. Also in attendance was our own PGM R.W.Bro John Morgan and his deputy V.W.Bro Phil Voisey, R.W.Bro David Powell, PGM Monmouthshire and R.W.Bro Derek Thomas the past PGM of Monmouthshire, the glitterati! The Master and brethren of Eldon Mark Lodge were there on their occasion of their annual fraternal visit in splendid numbers. The Master, W.Bro Barry Jones and his officers performed an excellent ceremony of advancement for candidate For Jeff Willis, he and indeed everyone watching could not fail but to have been impressed. The Assistant Grand Master presented Bro Harvey Jones with his Grand Lodge certificate giving a very eloquent explanation of its symbolism and meaning. It was a truly memorable occasion that was thoroughly enjoyed by all who were privileged to be present. Master Barry Jones flanked by this evenings candidate Jeff Willis, left and Master of Eldon Lodge Jim Fletcher. The Assistant Grand Master joined by the members of Eldon Lodge on their fraternal visit. The lodge was packed this evening with members and visitors. The Master and brethren of Eldon Mark Lodge came on their annual fraternal visit in splendid numbers. The photo shows some of the members of Eldon Lodge with the Master of Hallam Malcolm Ashford in the centre, to his left is Jim Fletcher Master of Eldon Mark Lodge. The highlight of the evening was a demonstration of the Advancement ceremony with R.W.Bro John Morgan, the Provincial Grand Master, in the chair. He was ably assisted by his Wardens, R.W.Bro David Nelson Past PGM as SW and R.W.Bro Derek Thomas Provincial Grand Master for Monmouthshire as his Junior Warden. No less than three other Very Worshipful brethren took part in the ceremony. The acting candidate was Bro Phil Moore. All the brethren agreed it was very well done, well they couldn't say anything else could they!! In the photo left to right, Ray Guthrie, Geoff Nash, Derek Thomas, John Morgan, David Nelson, Derek Wilton and David Powell. Hallam Mark Lodge enjoyed a superb meeting under the guidance of the outgoing Master W.Bro David Marriott , the lodge was honoured with the presence of W.Bro David Lyons Provincial Grand Almoner representing the Provincial Grand Master. W.Bro Tony Price led eight members of George Norman Lodge across from Yatton with the Travelling Keystone , his presentation was a precursor to the highlight of the evening ,a faultless and meaningful Installation by W.Bro David to Install Bro Malcolm Ashford into the Chair. All present agreed it was a “job well done “ ! !, W.Bro Malcolm was soon quickly into his stride and confidence investing his officers , and carrying out the business of the evening, before retiring to a very early Christmas Roast Turkey dinner ! Which was enjoyed by all especially W.Bro Sandy Sandford ! W.Bro Neil Hurcum ,PAGSwdB, Secretary. Tony Price, Master of the George Norman Lodge of MMM No 967 presents the Somerset Travelling Keystone to Hallam Lodge. Roger Morss JW, Mark Golding - Provincial DC, David Lyons - Provincial Almoner, Malcom Ashford - Master, Barry Jones - SW and Dave Marriott. Our outgoing Worshipful Master W.Bro Andy Wade topped off a successful year in office with a superb Installation ceremony , installing Bro David Marriott into the Chair , all present agreed the Inner workings were some of the finest they had witnessed , and with a PGM , Deputy PGM and Provincial DC in attendance thats a lot of ceremonies witnessed to compare against! The Lodge was delighted to be able to send off a happy Provincial DC , W.Bro Ray Johnstone-Smith into “retirement” with a smile on his face! W.Bro Andy can look back over his tenure with pride having advanced 2 candidates and hosting Hallam’s first “Master Masons” evening which has already proved a success in attracting lots of interest and some definite candidates. We were very pleased to welcome back out of retirement RW Bro David Nelson who performed with aplomb the Secrets at our September meeting and we were able to witness a rare sight in November as the PGM presented W.Bro Bob Cole with a Provincial Grand Masters Certificate of Merit , only 4 others are currently held in the Province ! W.Bro Bob was somewhat speechless and maintained he had “done his best!”. We look forward to another warm and happy year under our new Worshipful Master Bro Dave Marriott . Report - Neil Hurcum , Secretary. A quick look back over the past year , in April 2013 W.Bro Ian McNaught taking the helm to lead us through another successful Hallam year. Our Worshipful Master W.Bro Ian McNaught underwent the surgeons knife forcing him to miss our September meeting, his place ably taken by W.Bro John Morgan who led his team of officers through a super ceremony for our candidate Bro Luke Hebden. With our WM enduring the flying from Scotland he was back at the helm performing excellent advancements ceremonies ;in November, Bro Tony Syms and in February Bro Jeff Kerr were advanced into the Lodge. The Forfar Guide Dog centre were delighted that Freemasons in Somerset were willing and able to support their valuable work in Scotland with their donation. New boy Bro Tony Syms rubbing shoulders with VW Bro Guthrie ! WM David Bussell flanked by his two Wardens Andy Wade and Dave Marriott following the DCs instructions and giving him the knocks of the degree! WM W.Bro D Bussell flanked by his two Wardens BrO A Wade and Bro D Marriott following the DCs instructions and giving him the knocks of the degree! The Lodge has continued to support many charitable causes throughout the year including the Free wheelers, Somerset Community Foundation for Flood Relief, and culminating in a packed out Scottish themed Sunday Lunch where the WM was able to donate £1000 to the Forfar Guide Dog Training Centre also with a little help from his 2003 Craft Circle. With our Installation meeting to go in April 2014, W.Bro David Bussell was Installed in fine style by W.Bro McNaught , and W.Bro David took to the Chair in his own inimitable style ! It was also a happy and memorable night for our retiring PGM on his final official Installation, more details to follow in Triangle., and we thank you R.W Bro David for being a great supported of Hallam Lodge and we wish you a happy retirement. 28th November 2012 - A double event!! The 28th November 2012 will long remain in the memories of those present as a very special night for Hallam Lodge and in particular its advancee Bro George Sargeant and its ever young veteran W.Bro Bob Cole who was celebrating 50 years in Mark Masonry to the very night. The Signing in Book looked like a who's who of Somerset Freemasonry ! In attendance amongst many, were the PGMs of both Mark and Craft , the Mark Deputy PGM , Past Deputy PGM , a Very Worshipful brother and a Deputy Grand Sword Bearer to boot !! With the Worshipful Master unavoidably absent VW Bro Ray Guthrie took the chair and with the assistance of the Lodge officers performed a wonderful Advancement ceremony for Bro George Sargeant, who could not fail to have been impressed with not only the ritual but the manner in which the meaning of the Mark Ceremony was communicated. Apart from having an office in Hallam for probably 47 of the last 50 years nothing much has happened but I have enjoyed every minute! PGM David Nelson presents certificate from the Grand Master to Bob Cole. With the temple buzzing RW Bro David Nelson took the floor to congratulate W.Bro Bob Cole on his 50th year in Mark Masonry , and what an achievement in that time Bob had taken every office except Organist! The PGM presented Bob with both a Certificate from Grand Lodge and also from the Province of Somerset to mark the occasion and thanked Bob for being a "great masonic friend to many brethren". A gift from the Lodge was presented by VW Bro Guthrie and Bob made his normal self effacing reply , finishing with the words , "apart from having an office in Hallam for probably 47 of the last 50 years nothing much has happened but I have enjoyed every minute! " The Festive Board was the normal happy Hallam experience full of animated conversation, laughter and good humour , and especially a superb Festive Board thanks to Zena. A truly memorable night to remember. 25th April 2012 - Installation Night. Terry Foad, right installs his successor Edward Henderson into the Chair of Hallam Lodge in the presence of David Nelson, Provincial Grand Master. 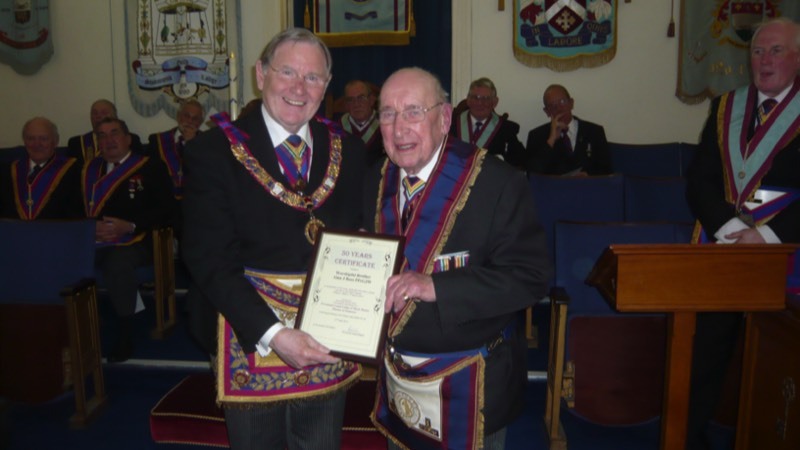 The photo below shows W.Bro Alun Rees receiving a certificate from the PGM celebrating his 50 years as a Mark Master Mason. The principal officers of Hallam Lodge appointed 21st April 2010.
left to right, Terry Foad - Senior Warden, David Nelson PGM, Master - Barry Webster, Provincial Junior Warden - Neil Hawes and lodge Junior Warden, Edward Henderson. 24th Feb 2010. Mark Master Masons make a fantastic job of the Lecture. The usual convivial atmosphere pervaded at Hallam Lodge the regular meeting on 24th February, with the Deputy PGM in attendance as well as the annual contingent visiting from Foster Mark Lodge , Wotton under Edge, Bro Tim Reynolds was ably advanced by W.Bro Andy Gray and his team of officers . The highlight of the ceremony was a superb rendition of the Lecture on the Degree of a Mark Master Mason given in catechetical form for the first time in Hallam Lodge. Three of our newest brethren , Bros Dave Marriott , Andy Wade and Alan Trask along with the young at heart W.Bro Derek Wilton , gave an outstanding lecture which was met with much praise throughout the evening , impressing members and visitors alike. With Bro Barrie Webster elected as Master for the ensuing year , Hallam Lodge looks forward to another happy and healthy new season. 13th January 2010, Sunday Lunch over £1600 raised for charity. 17th October 2011 - Bob Cole 50th Certificate presentation. 22nd October 2011 - 90th Birthday party & £750 donation to the Royal British Legion. 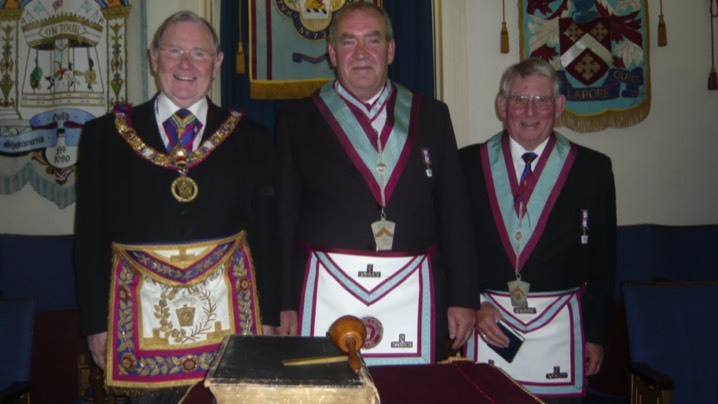 22nd Feb 2012 - Past Masters ceremony completes 90th celebrations. April 2012 - Hallam donates £750 to H4H. 31st May 2016 - Hallam Lodge Honours board, the link to HMS Lion and the Battle of Jutland. Like some of the Craft Lodges meeting at Clevedon, Hallam takes its name from one of the romantic poets of the 19th century. Arthur Henry Hallam. (1 February 1811 – 15 September 1833) was born in London son of a historian, Henry Hallam. He attended school at Eton, where he met future British Prime Minister, William Ewart Gladstone. They were good friends until Hallam left to travel in Italy and Gladstone matriculated at Oxford. In October 1828, Hallam went up to Trinity College, Cambridge. Here he met Tennyson. Both joined a group known as the Cambridge Apostles, and their shared interests led to a close friendship. Hallam published a review of Tennyson's 1830 work "Poems Chiefly Lyrical", and became engaged to Tennyson's sister, Emilia, in 1832. While travelling abroad with his father, he died suddenly in Vienna of a brain hemorrhage in September 1833. Tennyson dedicated one of his greatest poems to Hallam (In Memoriam A.H.H. ), and stated that the dramatic monologue "Ulyssis" was "more written with the feeling of [Hallam's] loss upon me than many poems in [the publication] In Memoriam". Tennyson named his elder son after his late friend. Emilia Tennyson also named her elder son, Arthur Henry Hallam, in his honour. Hallam is buried at St. Andrew's Church in Clevedon.